When it comes to providing a professional mobile bar hire service for your wedding look no further than Solid State UK, we have years of experience in the events industry and we know exactly how to deliver and manage a successful event. 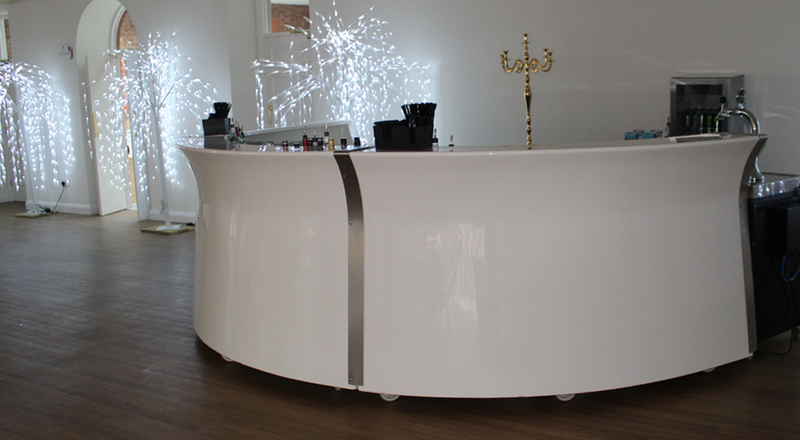 One of our most popular bar hire options is definitely our white gloss bar, which is perfect for a wide range of events including weddings, corporate events, awards evenings and even birthday parties. All our bars are available for either a wet or dry hire service. Included in our full wet bar hire service are fully trained bar tenders, a great selection of drinks at affordable prices, payment and voucher options, free glassware and refrigeration for your drinks and even a menu display. However if you can provide all the above our bars can be hired out on a dry hire service where you collect your chosen bar from our unit and return it after your event. Our classy gloss bar can be supplied in 3 or 4 sections, which creates a 2.7m or a 4.1m bar made up of straight sections and corner pods. Included with our white gloss bar is shelving units for glassware and an under counter storage. Made from GRP reinforced fibreglass with a steel frame our white gloss bar really is a very high quality product.